Ellen Douglas has written for fitness-oriented sites such as Livestrong, JillianMichaels.com, AZCentral Healthy Living and eHow. She also provides informational articles for clinics and private practices on health topics that include sports, nutrition, physical therapy and home remedies. Chamomile tea is gentle enough to calm colic-plagued babies, and yet strong enough to induce sleep in adults when used at greater strength. Some people turn to chamomile to address a number of ills, from anxiety to stomach ulcers. But when it comes to serious medical issues like high blood pressure, chamomile's tea health benefits are indirect at best. Always seek advise from your doctor on the best treatment for your blood pressure, also known as hypertension. High blood pressure can lead to stroke or heart failure. People with high blood pressure may either have a high level of force from the blood against the walls of their arteries when their heart beats, which is systolic blood pressure, or when the heart is at rest, which is diastolic blood pressure. Both numbers might be elevated. Doctors usually refer to blood pressure as a number "over" a second number, or systolic over diastolic. The desired blood pressure is about 120 over 80 mm Hg. Some doctors consider 115 over 75 an even healthier goal, reports the medical website. If it is higher than 120 over 80, your doctor may suggest prescription medication to lower your blood pressure levels. Getting more exercise and sleep, as well as eating a healthier diet will likely also form a significant part of your doctor's advice. Chamomile tea generally comes from German, rather than Roman chamomile, although both herb varieties have useful properties. Healers consider chamomile mild but effective, notes the University of Maryland Medical Center. It causes few side effects, yet its reputation for promoting relaxation is legendary, dating back thousands of years. According to UMMC, the infused dry or fresh flowers of chamomile may fight insomnia when taken at bedtime or ease anxiety during the day. Some people also turn to chamomile tea to ease stomach complaints or, when cooled and applied topically, to soothe skin rashes and mouth sores. Give babies only 1 to 2 ounces of chamomile tea, and young children about 4 ounces For daytime use, adults may choose to drink about 2 tbsp. of the herb infused in 8 ounces of boiling water a few times a day. Use 3 tablespoons in bedtime formulas. Chamomile is not one of the specific recommended alternative therapies to address high blood pressure. But for people who experience blood pressure spikes due to stress, the tea may contribute indirect benefits. 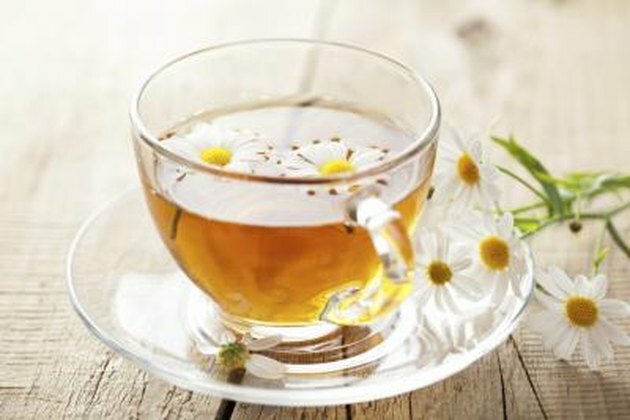 Chamomile tea may help reduce your anxiety levels and promote sleep, two factors that are key to maintaining healthy blood pressure levels. UMMC additionally recommends drinking 6 to 8 glasses of water each day. For people who enjoy drinking tea, a cup or two of chamomile tea contributes to that recommendation. UMMC includes hibiscus tea on its list of potentially beneficial herbs for people with high blood pressure. If your doctor approves, drink one cup a day of the tea. If you grow and dry your own Hibiscus sabdariffa flowers, infuse and strain 2 tbsp of the flower in each 8 ounce serving of tea. The Iranian yarrow variety Achillea wilhelmsii, also shows promise when used in tincture form. Additionally, foods or supplements containing garlic, cocoa, omega-3 fatty acids, calcium, cod liver oil, coenzyme Q10 or psyllium are also recommended. Does Ashwagandha Help You Sleep? Can Ginger Tea Keep You Awake?